It's not stalking if you have a licence: Knock Knock. Or how I ended up on the wrong end of a search warrant. Knock Knock. Or how I ended up on the wrong end of a search warrant. 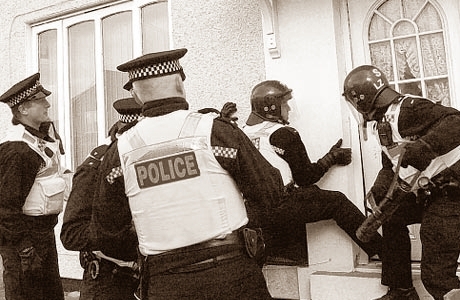 As I tweeted the other week Dear Reader, I had the amusing (if not bemusing) experience of being awoken early in the morning to the sound of the police executing a Search Warrant on the premises. Actually, I thought it might have been a friend of mine playing a bit of an early morning joke but the vests and the handguns (to be fair, they remained holstered throughout) soon disabused me of that notion. So what was it all about I hear you ask? Well, it certainly wasn't about me! But first let me give you a run down on what happened. I was allowed to dress and come outside to speak with an officer who explained that they were effecting a Search Warrant and that, for the meantime, while I was not under arrest, I was detained and not free to leave. He took my particulars and laughed when I told him I was a private investigator. As he put it, I was at the wrong place at the wrong time. Because I live in a cabin on the property and not in the main house, they decided, to allow me to go and do some work, that they would deal with me first. A specialist search team came in and went through the cabin. They may have only taken about ten minutes, it wasn't a very long search. Afterwards, since electronic devices such as phones, tablets, and computers were specified in the Warrant, I was asked about my phone numbers, the IMEI numbers for the handsets (like I have any idea) and also the SIM card details. Also I was asked when I last used the phones and whether the tablet could access the internet etc. They didn't appear too concerned about my computer though, just confirmed that it was connected to the house's internet via ethernet cable. And I was asked to provide my email address. Now I know I could probably have played silly buggers and refused to provide that information but since I know that I am not involved in whatever matter they are investigating, and that I rely upon the police not dicking me around in my line of work, I had no reason NOT to co-operate fully. And so, an hour or so later, I was allowed to leave with my bag of files and go get some work done - although I had planned on remaining home that day to write up some badly needed reports. Oh well, the excuse was a good one. I was allowed to return to my cabin later in the afternoon where I was informed that the property owner had been arrested and was helping the police in their enquiries. Hmmmm. Well, the next day the owner was released on bail and apologised for what had happened. I'm not going to go into detail on what the matter was concerning since this is before the Courts, but it apparantly was a police operation from their organised and financial crimes unit. The property owner had, he told me, done a favour for someone he knew and sent money abroad via Western Union. Apparently, when doing so, Western Union require the sender to provide proof of address (usually in the form of a utilities bill), which the other party did not have due to his living arrangement. He didn't really want to do this at the time but the other party managed to talk him into changing his mind. Turns out that transaction was one of many flagged in regards to the importation of something not very legal, if you catch my drift? PS, the search team missed a couple of items in my room that I would have expected to have been at least questioned on the reasons of my having them; in particular my ASP extendable baton, and my two lockpick sets. I guess they were looking for something else.